Deep In The Desert, Monks Make Transcendent Music "To chant, to sing, engages one's whole being," says Brother Christian Leisy of the Monastery of Christ in the Desert. The Benedictine monks who live outside Santa Fe have released an album of Gregorian chant. 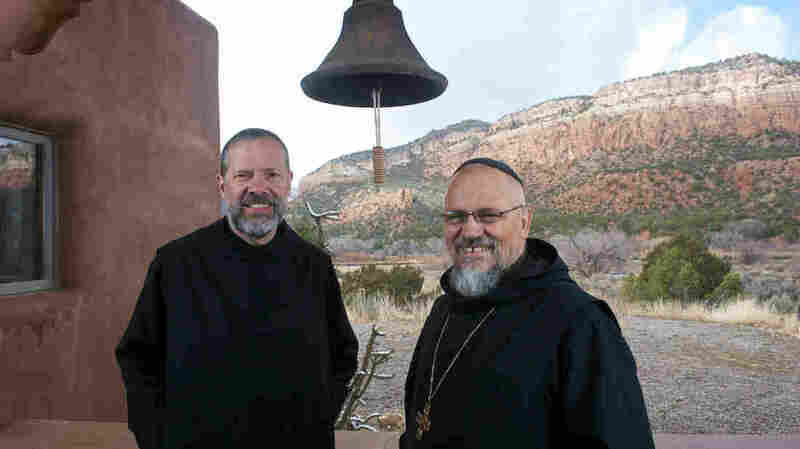 Brother Christian Leisy (left) and Abbot Philip Lawrence at the Monastery of Christ in the Desert in Abiquiu, N.M. If you drive about an hour and a half north of Santa Fe, N.M., into a place called the Chama Canyon, you might hear the clanging of church bells in the distance. The Monastery of Christ in the Desert was founded there in 1964 and is home to a community of Benedictine monks. They spend their days in prayer, work, meditation — and music. For years, the monks have generated revenue for the monastery by making and selling beer and handicrafts. Now they've launched another venture: sharing their distinct sound. They recently released an album of Gregorian chant, appropriately titled Blessings, Peace and Harmony. Abbott Philip Lawrence and Brother Christian Leisy from the monastery spoke with Weekend Edition Sunday host Rachel Martin. "We come to the church throughout the day as a community to pray and sing," Leisy said. "It's a wonderful expression of joy [or] even sorrow, but of offering one's thoughts and all of one's deeds outside the church to God. One of the best ways to do it in our tradition throughout the ages has been through singing — and not just in the Catholic tradition or even just in the monastic tradition. To chant, to sing, engages one's whole being, really."